Mick Philpott, who last week was sentenced to life in prison for setting a fire which resulted in the deaths of six of his 17 children, looks set to become the kind of legend that conservative mothers scare their children with when they won’t do their homework and eat their greens. His case has caused political ructions and spawned a slew of TV specials in numbers normally reserved for matters of grave national importance, like wars or epidemics. For a man who loves the limelight it must all be very gratifying, after all he’s no stranger to being cast as public enemy number one. I’ve hesitated in posting on the case. After all, it’s only a couple of months since I swore my days of writing about sensational trials are over. But Mick Philpott fascinates me. I’ve seen his type before. Most of us have. While Philpott might be being cast as the product of Trash TV and The Benefit Culture, his story is sadly nothing new. Men like him have been making bogey men for centuries. There’s something about that particular blend of monomaniacal swagger and ruthless selfishness that stops those of us who consider ourselves law abiding, or god fearing or unassuming members of society, in our tracks. We baulk at such shameless profiteering, such casual cruelty. It’s natural. If society has too many Mick Philpott’s in it’s midst the whole thing will come crashing down. Delivering her sentence, the trial judge in the Philpott case went into unusual detail in highlighting a particular part of the evidence, including matters which had not been put before the jury. Mrs Justice Thirlwall’s full sentencing speech makes interesting reading and it’s also worth reading Grace Dent’s analysis of it. Both make clear the fact that Philpott was a very specific type of abuser. Dent compares him to Fred West, which is a fair enough but I’ve been struck by another comparison , a case I wrote about at the time and which sparked a similar furore in Ireland after the sentence, that of wannabe ruler of the New World Order and friend of social workers and gardai, Ronnie Dunbar. I sat next to Dunbar for pretty much every day of his trial. That was back before criminal trials moved out of the Four Courts into the new Criminal Courts of Justice and in the absence of press benches the press often found ourselves sitting beside the prisoner in the dock. As the only left handed hack in the pack I usually found myself shunted down to the end of the row by clashing elbows. As a consequence I’ve sat next to quite a few of Ireland’s most notorious murderers. Most of them are very polite. Dunbar was a particularly chivalrous child killer. He would great me with a warm smile each morning and once or twice bent to pick up a dropped pen. It’s unusual for a defendant to be so outgoing with members of the press but in this case, no one was particularly surprised. We’d already been regaled with stories in the press room from a colleague who’d doorstepped him during the hunt for his victim Melissa Mahon, whose body was undiscovered for two years. This journo, who’d fully expected to have the door slammed in his face was amazed to be ushered into the house. Dunbar shared that with Philpott. He liked the attention. That craving for attention tends to put us on the back foot. When someone is aggressively upfront and outgoing they illicit a conditioned response. We smile and comply and engage – even if every sense is screaming that this person is as dodgy as hell. Before the brain has a chance to step in the head nods and the mouth smiles politely. Men like Dunbar and Philpott thrive on this. They are not the kind of killers who will hang about on the fringes of a crime, drooling over their gory deeds like the villain in a TV cop show. They will be front and centre, helping in the search, appealing on TV, offering suggestions. Men like that are so obsessed with control that they will try to take it everywhere. They are flamboyant in their seeking, greedy, hungry. We are always put on the back foot. One of the most horrifying things about these cases is their inevitability, an inevitability most visible in hindsight. Fred West got help to lay the cement in the garage that covered the grave of one of his victims years before he was caught, Ronnie Dunbar became the go to person for albeit reluctant social services trying to care for vulnerable teen Melissa Mahon, Mick Philpott of course, was a memorable guest on the Jeremy Kyle Show. It’s easy to say after the fact that surely someone should have known. Surely the final tragic events could have been avoided? But these cases remind us that real life isn’t that easy. The clues might all be there but the great detective isn’t called in until after the fact and everyone else will smile through gritted teeth until it’s all too late. It’s not particularly surprising that cases like this become ciphers for other gripes. We seek justification, an easy ending. The idea that someone that blatant, that obviously dodgy, could go about with their swagger wreaking whatever havoc they may doesn’t sit well with an ordered society. So Ronnie Dunbar’s crime becomes a stick to beat the HSE with. Don’t get me wrong, there are massive failings in that area but the Dunbar case was the fault of one manipulative, narcissistic, sociopath not the social services in Sligo town. But it’s easier to think that it could have been prevented if the powers that be had been on their toes. It puts men like Philpott or Dunbar in a box, but that containment is an illusion. Men like Philpott and Dunbar and Fred West fascinate because they are truly horrifying. They act with such disregard of societal norms that strikes against some very deep taboos. That’s why this particular type of robber baron takes the headlines, why they appear and reappear in fiction and legend. 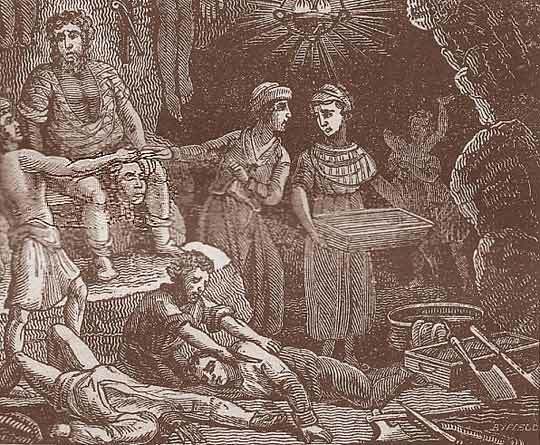 Take the case of Sawney Bean, illustrating this piece. It might have been a piece of anti Scottish propaganda but the tale of Sawney’s cannibal clan was used to terrorise generations of kids. The character crops up across popular culture too. Take Brian Blessed in Terry Nation’s original series of Survivors made in the 70s. His character Brod is a fictional take on much the same kind of character. I’m not belittling the harm that Philpott, Dunbar and West have done. We are better off recognising this kind of abusive arrogance wherever it occurs rather than treating each new instance as an aberration and looking for somewhere else to lay the blame. Serial killers and cannibals might be outside the norm but narcissistic sociopaths who think the world owes them are two a penny and too many of them get what they want. Take the revelations about Jimmy Saville or the abuse detailed in the Ferns Report (and the rest) or pirate radio’s most notorious child abuser Eamonn Cooke. Abuse on this scale can only take place because an awful lot of blind eyes are turned. Philpott and Dunbar were both treated in the past as harmless clowns. Philpott got to make more TV. Staff walked out of Radio Dublin in the 70s when rumours were known but Cooke’s abuse continued for years. I’ve mentioned a disparate mix of cases in this post. They really only have one thing in common. The sexual abuse of the vulnerable. Arrogant men abuse. Arrogant men who are pandered to and allowed to continue. Sometimes they kill. All of the time they ruin lives. I’m sick and tired of the constant surprise when these cases come to light. These men are predators. We should instinctively know how to spot them. It should be so deep rooted in us that we will run a mile but again and again those blind eyes are turned and nothing is done until it’s too late. The big, bad wolf is not cuddly. He’s a menace. He’s never a product of a society, however ill. He’s the thing we’re supposed to be keeping out. I didn’t mean for this to turn into a rant but it really does piss me off. As a journalist I watched some of the worst of these as they swaggered through their trials, acting the gentleman or even the victim. I’ve seen their victims tremble. But I’ve also known my own big, bad wolf and I’ve been staggered at the blindness of others. Can we stop trying to blame these men on societies that are groaning at the seams and take a little bit of responsibility ourselves? I’m not in any way advocating anyone burning out their local paediatrician but if you know a child or a woman or a man who is in actually in trouble and who you genuinely feel is in danger for god’s sake say something to someone. The big, bad wolf does what he likes only when he’s allowed to and we all allow him. The big bad wolf pulls the wool over many an eye. Born actors.